You guys know that two of my biggest passions in life are books and theatre, and when the two come together (see Matilda the Musical and The Curious Incident of the Dog in the Night-Time, for example) magic happens. It doesn't occur often that it's the other way around though and it's a book that brings all of the stageyness rather than a novel being adapted for the theatre. 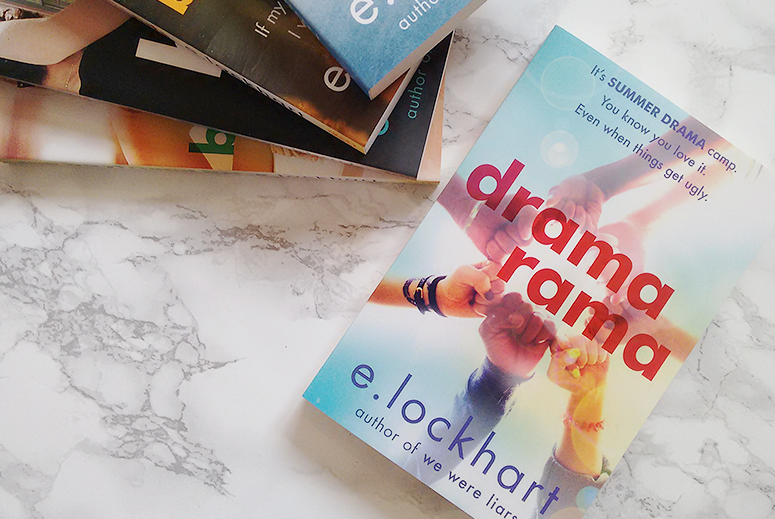 So when I heard of Dramarama, written by one of my current favourite young adult authors, being set at summer theatre camp I was instantly sold. Sarah and Douglas, better known as Sadye and Demi, are two best friends in a tiny town who love everything to do with theatre. They watch endless musicals together, singing along and re-enacting the most famous scenes, have tons of stagey in-jokes, and audition together for a special summer camp dedicated to theatre. They both get in and couldn't be happier to finally get away from the nothingness of their home town, and have a chance to show their true selves and shine. But as they start their time at summer camp, one of them starts to flourish and the other one is only mediocre. They get different interests and different friends, and they have to face the realisation that maybe they weren't meant to be best friends after all. Maybe they only gravitated towards one another because no-one else in their tiny town understood them, not because they naturally clicked. Will their friendship survive the endless drama of camp, or will it only push them further apart? I am a big fan of the novels by E. Lockhart, the characters within the pages are so realistic and the stories so diverse that each new book is an exciting discovery. I recently – finally – read We Were Liars, the book that propelled her to YA fame, and while the thriller was super intriguing and well-writen, my favourite novel by her hand is still the very clever and thought provoking The Disresputable History of Frankie Landau-Banks. I have to say though, Dramarama is a close second as I loved almost everything about it. What that hooked me from the very first chapter were the tons and tons of musical theatre references laced throughout the story. As someone who loves musicals I recognised almost all of them and instantly I felt that Sadye and Demi were my people. And despite the whirlwind summer they experience at camp, that feeling never left – creating an incredible closeness to the characters that had me absolutely gripped. And it wasn't just Demi and Sadye that attributed to this feeling, so did the other campers we get to know; Sadye's roommates Izzy, Candie and Nanette, and the boys hovering around the edges of Sadye and Demi's lives. I was also incredibly fascinated by the behind-the-scenes insight this book provided on the audition process, rehearsals and the variety of skills the teenagers needed for the roles they were preparing for at camp. This wasn't a relaxing summer of swimming and games, and sitting around campfires eating s'mores, drama camp was incredibly hard work and the people there were all desperate to get the most important part. It was a charged and competitive environment, where the teachers and fellow students pushed the campers to their very limits – sometimes past breaking point. Amid all that tension, strong friendships were forged and romance was blossoming, but there was also a lot of fighting and backstabbing. For many people getting a good part at the prestigious camp is their ultimate goal because it'll help them get on the next step to make their stagey dreams a reality and the lengths they're willing to go to creates a lot of drama (and not in the theatrical sense). While seeing the experience from Sadye's eyes, the other girls in her cabin each have their own struggles to deal with as well and as a reader you start caring about all of them. Dramarama is a novel about theatre and friendship, perseverance and self-awareness, talent and incredibly hard work. While I didn't love its conclusion, it made perfect sense in the context and I can't imagine any other way it could've ended. Despite her rocky journey throughout the book, not in the least because of her inability to not let her frustration get the better of her, I absolutely loved Sadye. Her anger and feeling of righteousness was justified in my eyes, and despite the unfair adversaries on her path it did end up making her a stronger person. And the journey to getting there was a fascinating one, not in the least because it was one filled with jazz hands and a touch of razzle dazzle. Dramarama is published by Hot Key Books and you can get your copy from Foyles or your own preferred retailer.